Wi-Fi is nice, but it’s rife with signal issues and it’s slower than a wired ethernet connection – even when Wi-Fi is performing its best. If you can wire up your devices, you should. File transfers, streaming and even your internet connection – if it’s over 25mbps – are all faster over a wired connection. But, wiring your house is a hassle. With all things internet and networking there is usually a learning curve during installation. Not so with the Powerline kit. After opening the box I quickly realized just how easy setup was going to be. 2 boxes that plug into a wall outlet and have a network connection on the bottom (RJ45). 1 CD that might have a manual or drivers or something on it. I never needed it. Plug the adapter into an AC wall outlet, connect it to your router via the included ethernet cable and plug the other adapter into any other AC wall outlet in your home and connect its network cable to your Bluray, laptop, whatever. Then you’re done. Viola, instant wired connection to anywhere in the house. Once you’re up and running you get speeds up to 200 megabytes per second and a 200-meter range within a single power line grid. The device even worked in my detached alley garage during testing. So your electric cables are magically turned into a networking cable – but does it work? Yep, sure does. My tests show that transferring about 500megs between 2 machines using this as the networking option is significantly faster than my wireless option. Wireless: 3 minutes, 36 seconds. Wired, using this Powerline Ethernet adapter: 1 minutes, 4 seconds. A huge difference. Streaming content to my Boxee Box and Xbox 360 from my computer improved significantly, no more choppy video! 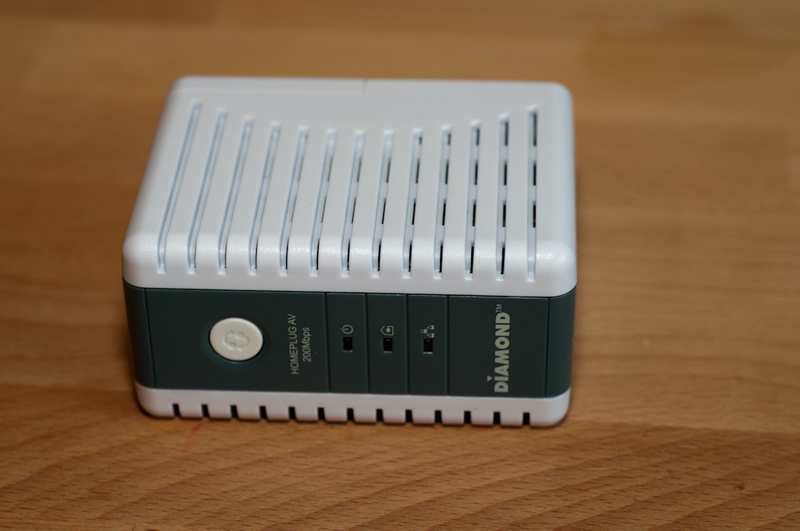 Overall, I’d highly recommend Diamond Multimedia’s HP200AV Powerline Internet AV Kit. It does exactly what it claims, and I have experienced no glitches, outages or hassles that would make me not want to use it. Admittedly, I didn’t originally think there was a need for this product. My wireless connection, I thought, was pretty good. I was wrong, now that I have a wired connection I don’t wan’t to go back. It’s much faster. It’s great for those looking for a speed boost and a great solution for wireless signals that can’t reach through brick walls.